Press passes have their benefits : Will the real BRAD BALDWIN please stand up? Will the real BRAD BALDWIN please stand up? 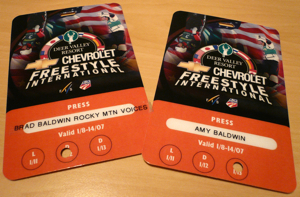 The Park City Chamber and Visitors Bureau and Deer Valley hired Rocky Mountain Voices to create a promo video for the Freestyle FIS World Cup event. I worked with Dan Campbell-Lloyd to produce the video since I was traveling at CES. Dan did a great job. Friday I hit the slopes with my video camera in hand to cover the aerial events. Wow. First off, I was amazed at the HEIGHT of the ramps. They were like 10 feet high. After the athletes did their amazing rotations and flips, they’d land on an amazingly steep slope and have to stop quickly. Tough stuff. I caught a Swiss athlete over rotate and land on his back and side. Unfortunately, he was removed by the medical crew and flown away in a helicopter. Tonight I took Amy with me. She was cold but looked cute all bundled up in her winter gear. She put up with me dragging her out in -13 degree weather. I taped some interviews with attendees that Deer Valley can use next year in a promo video. We also watched and filmed the mogul event. After, we hung in the VIP tent to warm up while we listened to The Wailers play on the Venue Stage. Golfshot and Hole 19 on the #AppleWatch. http://t…. Merry Christmas from the @miss_bridget96 Family…. Copyright © 2007 Will the real BRAD BALDWIN please stand up?